Microsoft closed their conference with the announcement that the Xbox One will be available this November with a $500 price tag and Titanfall’s official reveal. A trailer prefaced Respawn Entertainment’s stage debut and a gameplay demo. Titanfall will be an Xbox console exclusive and is set to be released spring 2014. I’ll post videos when they become available. 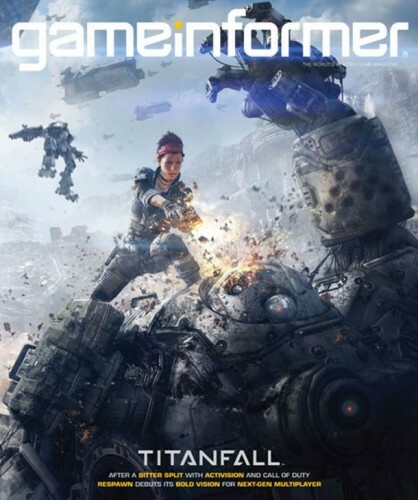 Just days before E3, the first title from Respawn Entertainment has been outed by the leaked GameInformer cover. Titled Titanfall, the game is supposedly coming only to Xbox One, Xbox 360, and PC. There were rumors floating around that the game would be an Xbox console exclusive, and those appear to be true. The game will be multiplayer-focused with the Xbox One version heavily utilizing the power of the cloud (one of the things Microsoft was touting for its next-gen console); the Xbox 360 version is being outsourced to a different studio. I’m sure we’ll learn more about this game in just a few days when E3 is upon us. I want to apologize for that posting break. It was undesirably long but entirely necessary. I’ve been working on getting some things in my personal life straightened out (mainly living and financial stuffs), so I’ve been away and unavailable for the past two weeks. I’m slowly but surely getting things in order, so hopefully there won’t be as many long pauses between updates and I’ll be able to get all the latest and greatest entertainment news up for you to view. I really do appreciate all of my readers and their support, so stick around and I’ll try my best not to disappoint you! It’s been a long time coming, but we’ve finally got the fourth season of Arrested Development available exclusively on Netflix. The show was cancelled by Fox back in 2006 due to low viewership despite critical acclaim. Fans have been clamoring for a continuation of the comedy for years and it’s now a reality as the 15-season is now online for Netflix subscribers to enjoy. I will be posting a review as soon as I get a chance to enjoy the continuing Bluth saga.